This breakdown comes from two individual sessions from Ignite that I’ve sat and watched. The first is the roadmap and overview for OneDrive, the second was a deeper dive into the Sync client itself and the move towards a unified experience. 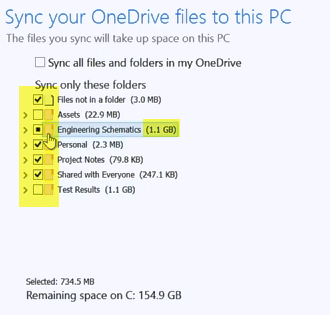 http://channel9.msdn.com/Events/Ignite/2015/BRK4110 – I Sync, therefore I am – The deep dive into the sync capabilities. Microsoft acknowledge that OneDrive isn’t where it needs to be and remains a number one priority to resolve the issues, primarily around sync. They have committed to delivering a new Sync client by the end of this calendar year! The sync client is based on the consumer engine, specifically because it has proved to be capable of delivering at scale, without the restrictions that the old Groove engine had. MS have committed to removing the 20,000 file limit and (later rather than sooner removing the 5K limit for SPO libraries). The new client will also support selective sync per device, allowing for separation of what files are synced to which device. Looking to reduce the total footprint of the application, including removing some of the double caching that currently happens. For MS, the focus of OD4B is for INFORMAL collaboration, the presenter was at great pains to differentiate the informal collaboration that happens in personal drives, against the more formal collaboration that should happen in team sites. For MS, it is important that the new client adheres to the Office 365 promise of Audit, security and control yet doesn’t get in the way of people doing their jobs. They’ve been delivering small updates to tweak the experience, but the main effort is on providing the new clients. He demo’d the new web client which doesn’t look vastly different to the old client, but has additional left nav options such as Recent which provides a delve style view of content, Shared With me, content from other peoples OneDrives and SiteFolders for team sites that have been followed. Search picks up across OneDrive, SPO and items shared specifically with you using the Office Graph. New document previews use the same experience as OWS in SPO and editing documents in these clients is identical to SPO/OWS experience. Note:Online document co-authoring now shows real time updates! Modern Attachments – Nice integration with the Outlook Web Access client, Select an attachment from OneDrive leaves the attachment there, creates a link to the file and amends the permissions on the object. Overall, MS are starting to align the actions across the browser/device and various clients although they admit there is still some way to go. However some of this synchronicity across experiences is starting to show in the Android and iOS versions with a move towards a single Unified client for both OneDrive and OneDrive for Business. iOS and Android apps are the first Unified releases, the iOS app on iPad was demoed showing multiple OD4B accounts and a personal account. Editing in OWS was seamless with multi authoring looking great. The app includes search integration and recycle bin access providing similar behaviours and experience between the web client and the app. Provision of an auditing and reporting function – primarily allows for investigating users and usage, not currently for usage and adoption but that’s coming. Through the O365 Compliance centre. Data Loss prevention – Currently in pre-release, preview through summer and in place by end of year. Defined DLP policies can be defined to prevent uploading of files with data such as credit card numbers etc. Blocks, Tips and notifications all available. IRM extended for use in OD4B and will be able to be applied in conjunction with DLP policies. IT will have control to block sync on unmanaged devices, preventing offline copies. When you select a file, the options appear under the ribbon area. I hope this has proved useful as a summary, but I do recommend that you take time to watch the video on Channel 9 if you can!